Marine 65 by 17-ft. aluminum crew boat named Joseph M.
Mto the Brazos Pilots Associa- members, with a footrest, cup holder, ed access around the vessel, and hand tion in Freeport, Texas. Brazos Pilot is a gooseneck light, and 110V USB plug rails have been placed for easy reach at 1982 by Breaux, the repower 64 x 19-ft. Defant-class monohull pilot at each seating position for comfort and all times. Low-level LED pathway light- was completed by the Weeks boat designed by Metal Shark and built convenience. ing enhances safety during nighttime op- crew at Dulac Shipyard. The at the company’s Franklin, La., shipyard. A settee and table are also provided in eration. This new pilot boat is intended to replace the main cabin. To meet the client’s requirements, a repowered crew boat achieved the pilots’ smaller, single-engine 40-ft. An integrated suite of navigation large pilot transfer platform was engi- 21 knots on sea trials and pilot boat, improving safety for crews electronics includes GPS, radar, depth neered into the vessel’s foredeck, with a is anticipated to show a 20 while enhancing service to operators and sounder, and AIS, which are accessed wide, integrated non-skid stairway and percent fuel savings over the providing around-the-clock service at primarily through three 19” Furuno specially-confgured safety rails. A spacious, climate-controlled wheel- video feeds via two CCTV cameras in- trols and a set of digital displays, which light equipment to dredges house employs Metal Shark’s signature stalled in the engine room. allow the operator to monitor engine working in the Northeast of “Pillarless Glass” for improved visibil- Accommodations include a galley area performance while controlling the vessel the US out of the port of Bar- ity, in a reverse-raked arrangement de- with microwave, cofee maker, refrigera- from this station. Large overhead skylights provide up- crew storage; and a berthing area with Twin Disc MGX5146SC transmissions ward visibility while approaching and double bunk, drawer storage, and a 4K and turning fve-bladed 36” x 43” Nibral operating alongside moving ships. 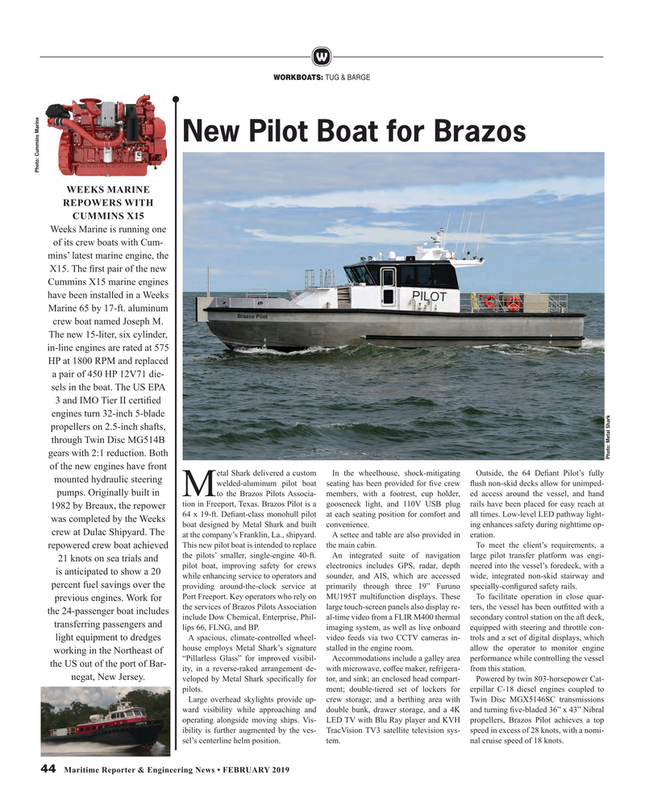 Vis- LED TV with Blu Ray player and KVH propellers, Brazos Pilot achieves a top ibility is further augmented by the ves- TracVision TV3 satellite television sys- speed in excess of 28 knots, with a nomi- sel’s centerline helm position. tem. nal cruise speed of 18 knots.